In February 2012, LACE hosted Dutch sound artist collective Staalplaat Soundsystem for a 10-day residency. 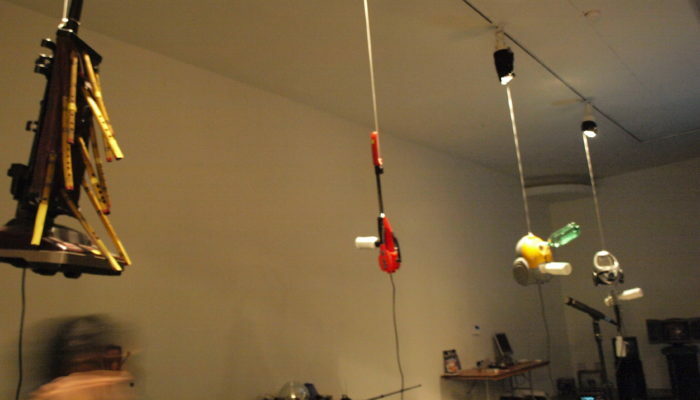 Using “everyday electronic junk” scavenged from thrift stores and donations, Staalplaat members Geert-Jan Hobijn and Carlo Crovato fashioned “sound machines” that were controllable by the audience via smartphones. This site specific, interactive sound installation then served as the focal point for a participatory sound performance in the LACE gallery. Throughout their residency, Hobijn and Crovato created and added more machines to an ever-growing installation in LACE’s main gallery space. In the final phase of the residency, they moved the installation to the storefront space, allowing visitors and the general public to conduct an “orchestra” via their mobile phone both inside LACE and outside from the Walk of Fame. Within the current mood of worshipping the latest technology in media art, Staalplaat Soundsystem provides a breath of fresh air, reminding us of the 100-year tradition of noise-making machines in which “mad” inventors and various kinds of artists operating in the margins of the art world meet. All videos by Amanda Mears. Since its inception in 2000, Staalplaat Soundsystem has started creating a multitude of “machine installations” using all manner of consumer electronics, such as a dozen floor polishers (Sweet Sissy and the Ballroom Hiss), and Avantilator, a composition for one hundred electric office fans. At the heart of this work is a low-tech philosophy: to make installations appear simple, revealing rather than concealing how they are made. Staalplaat Soundsystem has been showing works at several international festivals, museums, galleries and events like Avanto (Helsinki), Sonar (Barcelona), 798 South Gate space (Beijing), DEAF (Rotterdam), Transmediale (Berlin), DOM (Moscow), Ars Electronica (Linz), Todaysart (Den Haag), MOCA Taipei, Museeum Weserburg (Bremen), Townhouse Gallery (Cairo), Steirischer Herbst ( Graz), ZKM (Karlsruhe), Palais de Tokyo (Paris), Khoj International Artists (New Dehli), and Auditorium (Rome). This project is supported, in part, by public funds from the Netherlands Cultural Services (New York), in partnership with the Dutch Centre for International Cultural Activities (SICA); Music Center, the Netherlands; Netherlands Theatre Institute; and the Dutch Fund for the Performing Arts. Additional funds have been provided by a grant from the City of Los Angeles, Department of Cultural Affairs, and the Mondriaan Fund.